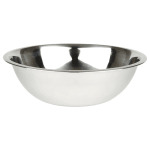 Mixing Bowl, 8 qt. 13-1/4 in Diameter, Stainless Steel. "It's not an 8 quart bowl. It will only hold 6 quarts."